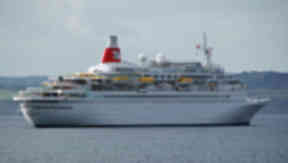 Fred Olsen's Black Watch, which is docked in Rosyth, was on a trip around Scandinavia when guests contracted the disease. A total of 130 passengers have contracted a sickness and diarrhoea bug on board a cruise ship now docked in Rosyth. The virus spread through the guests on board Fred Olsen’s Black Watch during a 12-night Scandinavia and St Peterburg cruise. The cruise had 778 guests on board. By the time the ship returned to Rosyth on Friday, 29 guests were still ill and specialist cleaners have been brought in to clean and fumigate. Fred Olsen said health authorities have been on board and are satisfied with the measures being taken. NHS Fife said the illness is thought to have been caused by Norovirus but the cruise company have now "undertaken all necessary steps". The company said any passengers who show symptoms of a virus on board are confined to their cabin for 48 hours and seen by the ship’s doctor before being allowed to join the rest of the cruise. The Black Watch is due to set off on the 12 night World Heritage Sites of Iberia cruise at 4.30pm but it is likely to be delayed as the cleaning is taking place. Passengers for the next cruise have been told of the outbreak by letter. A spokeswoman for the company said: "Fred Olsen Cruise Lines can confirm that, during Black Watch's 12-night 'Scandinavia & St. Petersburg' cruise, W1317, which departed from Rosyth on 8th September 2013, there was an outbreak of a gastro-enteritis-type illness, and every effort was made to contain the illness, in accordance with Fred Olsen. "Black Watch returned to Rosyth today, where she is currently undergoing an intensive cleaning and sanitisation programme, which includes a complete ship fumigation by professional external contractors. The ship arrived in Rosyth early this morning, in order that this process could begin as soon as possible. "Representatives from the local Health Authorities and Rosyth Port Health have been on board the ship this morning, and have confirmed that they are satisfied with the containment and preventative measures being undertaken by the ship. "It is frustrating that, even with the extra preventative and containment measures that were put in place, a number of guests on board Black Watch's 'Scandinavia & St. Petersburg' cruise suffered from this illness. "At Fred Olsen Cruise Lines, the health, safety and well-being of all our guests is paramount, and we believe that our systems for preventing the spread of illness on board our ships are amongst the best within the industry. Fred Olsen's cruise ships meet, at all times, the highest safety, hygiene and health standards, and comply fully with the strict requirements and inspections of their Flag State and relevant authorities." Director of Public Health Dr Edward Coyle said: "NHS Fife can confirm that a total of 130 cases of diarrhoea and vomiting, suspected to be due to Norovirus, have been reported on the Black Watch cruise ship which docked in Rosyth today. "The first case was reported on September 9th. The ship has applied its prevention and control plan and has been working with environmental health officers in Fife Council who have provided further advice and support, as necessary, to the cruise company. The cruise company has undertaken all necessary steps, including deep cleaning in affected areas and provision of health advice to disembarking passengers."